Honestly? I never thought I'd buy another Visconti. Frankly the brand never really spoke to me that much, and I already own -what I'd consider- their most intriguing pen, the Homo Sapiens (aka. the lava rock pen! Find my review HERE). Hearing and reading some of those 'horror stories' about Visconti's lacking quality control didn't exactly put them high on my wishlist either. But unexpected things can happen. And so I found myself at the Tilburg Pen Show, with Dennis from La Couronne Du Comte shoving a brand new Visconti Homo Sapiens Chiantishire fountain pen in my hands. I've known Dennis for many years, he's a great guy, and an even greater salesman (learned that the hard way)! He had an amazing show exclusive deal on them, so I caved and bought it against all odds. Quite an impulse buy for sure, but one I haven't regretted so far. Very impressive packaging, worthy of a pen in this price class! 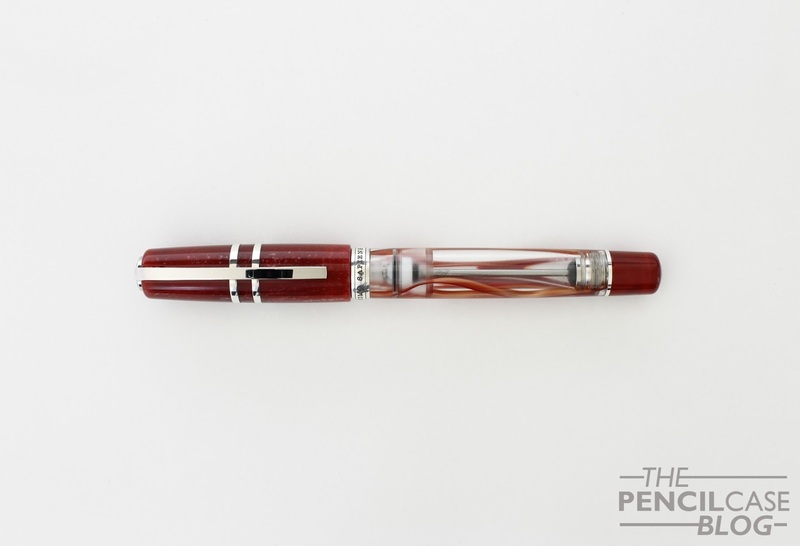 The Chiantishire is part of a series of acrylic pens with the same design as the regular 'lava rock' Homo Sapiens, and they are inspired by cities and regions around the world. Chiantishire comes from the Chianti region in Italy, and is a mocking term for the British upper-class that live and go on vacation in the Chianti region in Italy. This region is obviously known for their Chianti red wine, so of course the color theme is red. 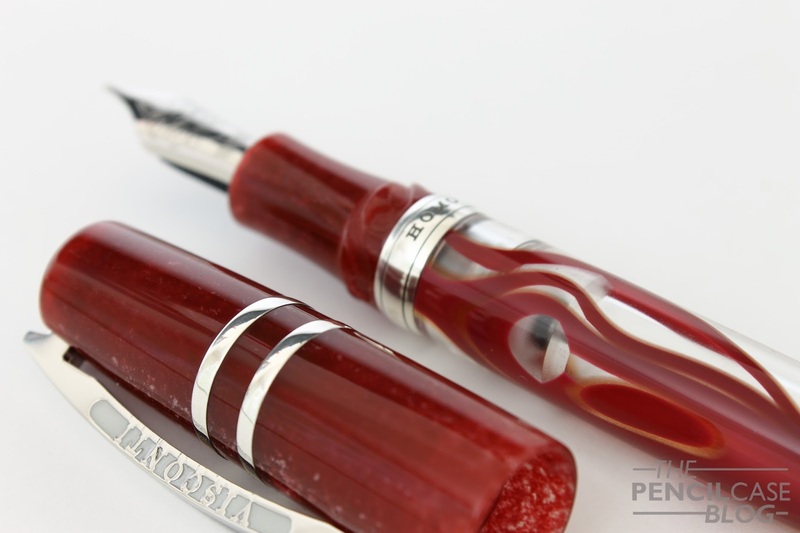 The cap, section and piston knob are made of a red marbled acrylic with subtle white streaks. 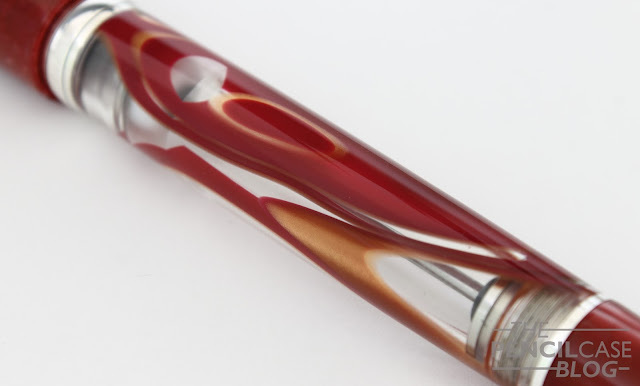 The main focus is the barrel, which is made from a custom clear acrylic filled with ribbons of red and gold celluloid. There's a whole lot going on in this pen, different materials, different colors and different patterns. The swirls in the acrylic part perhaps aren't spread as evenly across the body as I would've wanted, but that's unfortunately not something you can choose with cast acrylics. What I do like about the celluloid ribbons, is that they are red on one side, and gold on the other. Rotating the pen reveals the pearlescent chatoyance of the gold, which gives the pen some depth. The Chiantishire, being a more expensive limited edition, comes with sterling silver cap bands and clip. The center band and other trim at the piston knob are supposedly plated metal (rhodium or platinum? ), but I personally can't tell the difference. The arc-shaped clip is not everyone's cup of tea, it's definitely not the most functional. But in terms of design I do quite enjoy it. 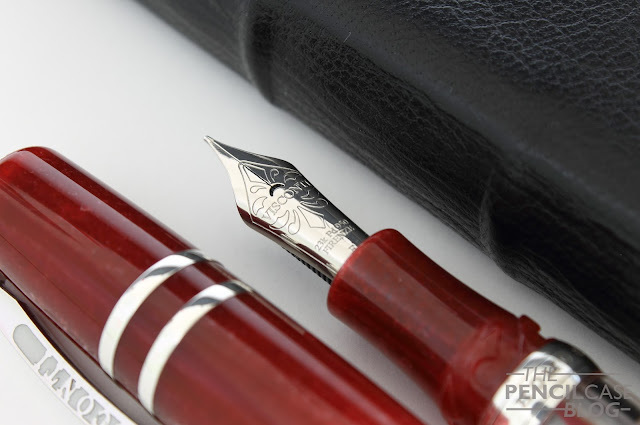 It's unique and adds a recogniseable character to Visconti's pens. The branding on both sides of the clip is enamel-filled (with white enamel to match the white swirls in the red acrylic parts!). 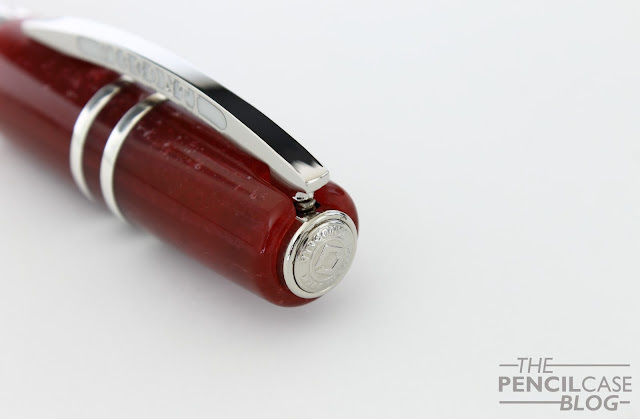 Another constant across all Visconti pens is the removable metal medallion on the cap finial. 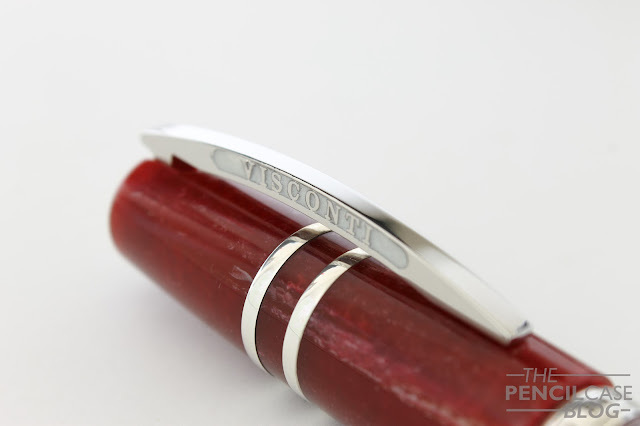 The 'My Pen' system allows you to change the finial with your initials or a gemstone to your own preference. It's a cool gimmick that I'm sure will appeal to some, but I actually like to stick with the visconti logo. The L.E. Chiantishire has the exact same dimensions as the large Homo Sapiens. Measuring in at 14.6 cm (5.7") closed, and 13.2 cm (5.2") uncapped, these are considerably large pens. The widest diameter at the cap is 1.7 cm (0.6"). The section measures a comfortable 1.1 cm and has a gentle taper. The total weight is close to 40 grams, but it doesn't feel heavy (a big part of the weight lies in the cap as well, so in terms of comfort it doesn't weigh down). It's large, but definitely not unwieldy. The section is large and has a comfortable shape. 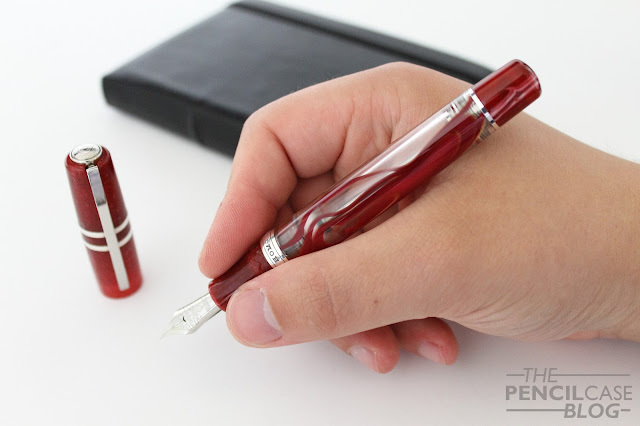 As all Homo Sapiens pens, the Chiantishire uses Visconti's 'Hook Safe' closure mechanism. The funky shape of the 'threads' is noticeable when you grip the pen, but the edges are polished so they didn't bother me. The raised center band behind the threads is smooth and rounded so it doesn't cause any discomfort either. I never felt the need to post the cap. It is possible but I wouldn't recommend it. The cap doesn't post very deep, and adds a lot of weight to the back. 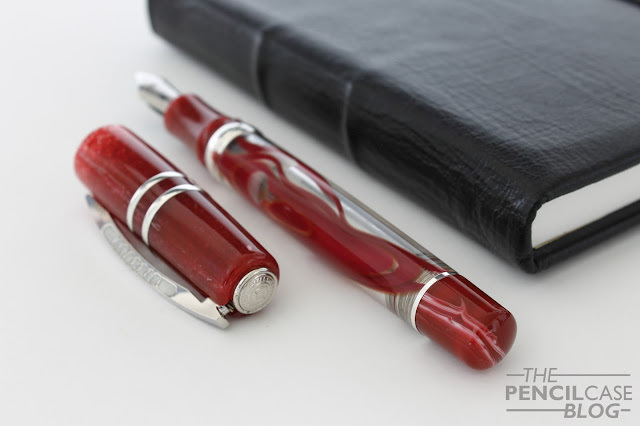 Overall, the lack of annoying steps or sharp threads, the comfortable section, and the larger dimensions, make for a very pleasant pen to use. 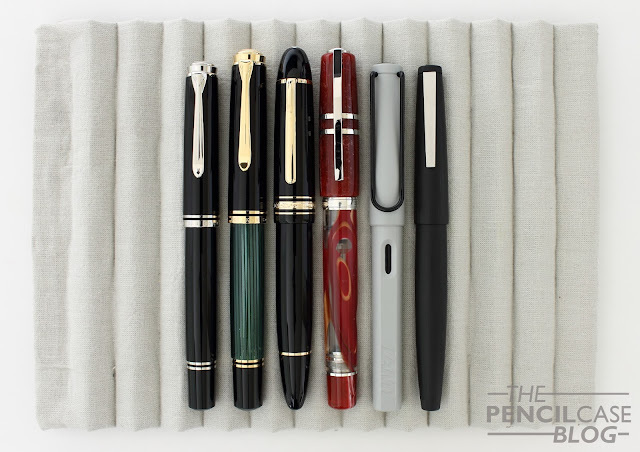 Comfort is definitely a strong suit, it's not just a pretty pen to look at. The double reservoir power filler, is a vacuum filling system that allows for a rather high ink capacity (1.5ml when completely filled). The double reservoir means that the inside of the barrel is literally separated into two reservoirs, a smaller one right behind the section, and a main reservoir behind the plunger. 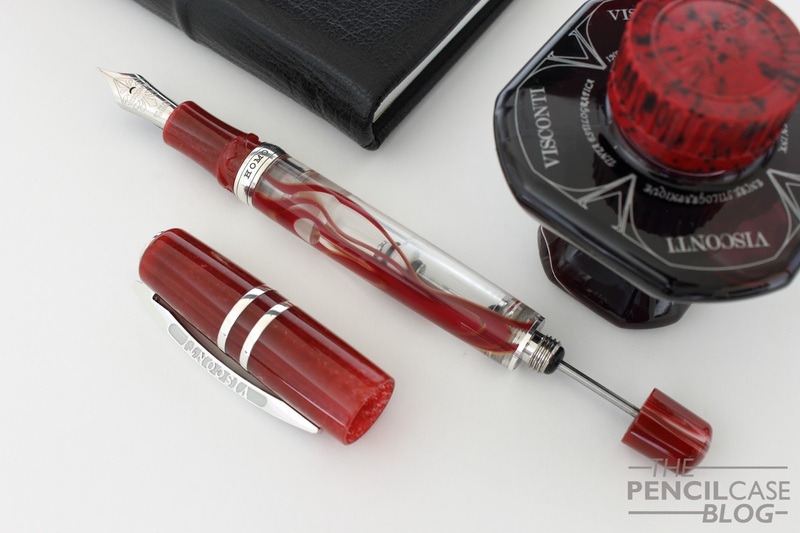 The smaller writing reservoir holds enough ink ready to go for a decent writing session, so you don't have to open the blind cap each time you write (which is a downside of normal vacuum fillers). Being able to close off the main ink reservoir means that it's less prone to leaking, making it ideal if you travel a lot. Visconti's 23k palladium Dreamtouch nibs have seen their fair share of issues. However my experience with this fine nib has been as positive as my previous experience with the 1.3mm stub on my HS Steel oversize. 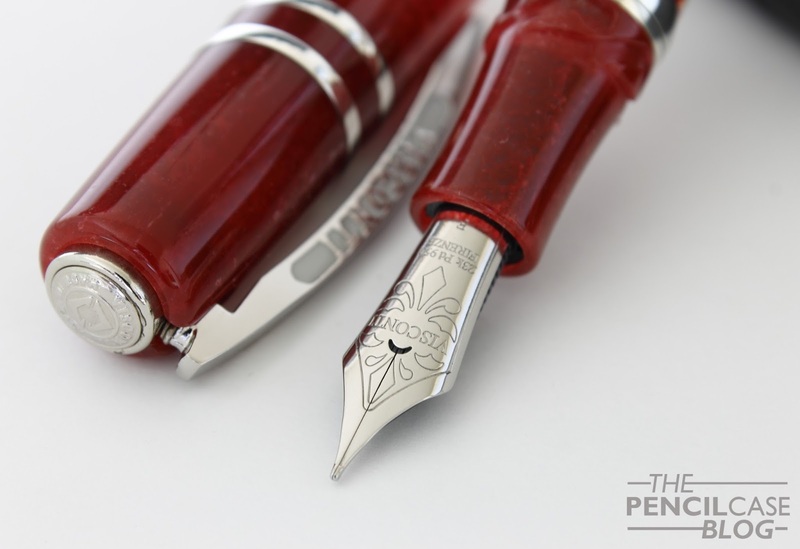 Of course it's impossible to judge an entire brand based on two of their pens, but either they upped their QC, or getting a good nib is just a matter of luck. In any case, I'd always recommend trying before you buy (and not just when you buy a Visconti). But as I said, my (limited) experience with Visconti nibs has actually been quite good. This fine nib has a balanced flow, not too wet nor too dry. The feed keeps up well. It's smooth to a certain extent, but definitely not overpolished. It's a reliable writer, and I never had it skip or hard start. I expected a springy nib, but this one is surprisingly hard. 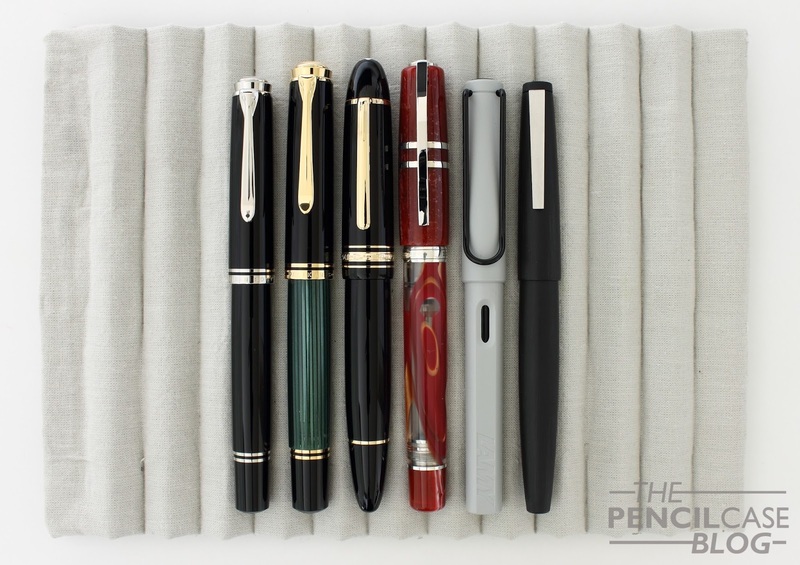 The Visconti Homo Sapiens Chiantishire retails for 850 EUR / 1100 USD, which is a 300 dollar premium over the regular lava rock oversize Homo Sapiens. That's a hefty premium on an already quite expensive pen. While I find the regular HS to be worth their price, this maybe feels a bit too expensive. If I hadn't bought mine at a discount, I probably never would've bought it at all. But that doesn't take away from the fact that it's a good looking pen and a fantastic writer. If it's worth it for you is -in the end- still a very subjective and personal choice. 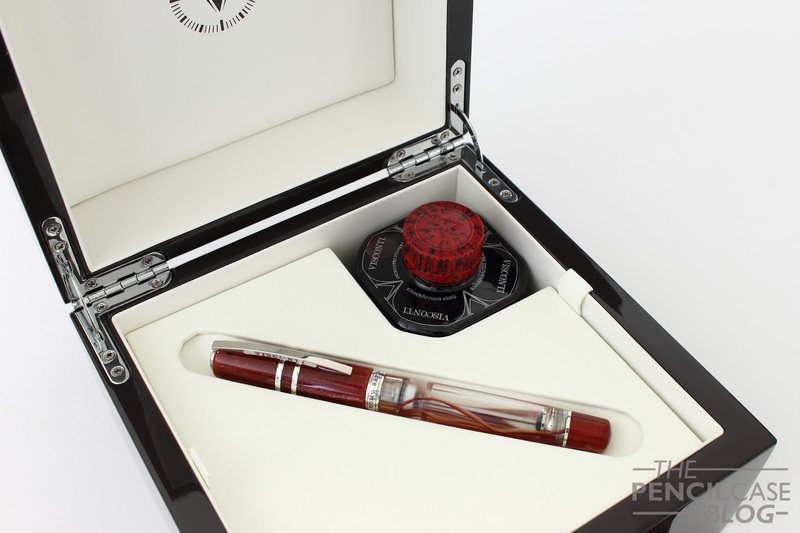 The Chiantishire is a limited and numbered edition of 888 pens. They usually remain available for a good while, and you can occasionally pick them up at a good deal (La Couronne Du Comte has a Christmas deal going for 680EUR on them right now! ).